So, I had some veggies left in my organics box before Thanksgiving and I wanted to make myself a light dinner. I realize how counter-intuitive it is to follow that statement with a pat of butter melting in a pan, but whatever....moderation. 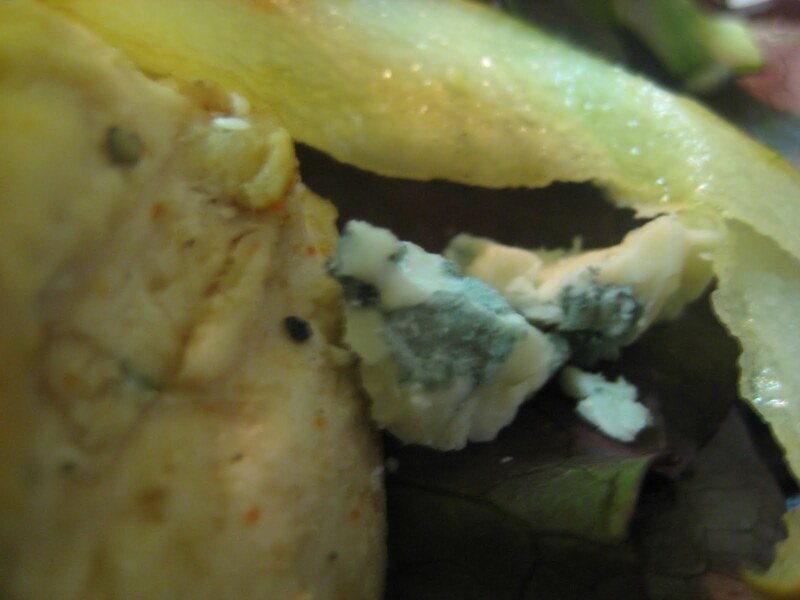 I had some red and green leaf lettuce, a bartlett pear, leftover cooked chicken breast, and blue cheese. 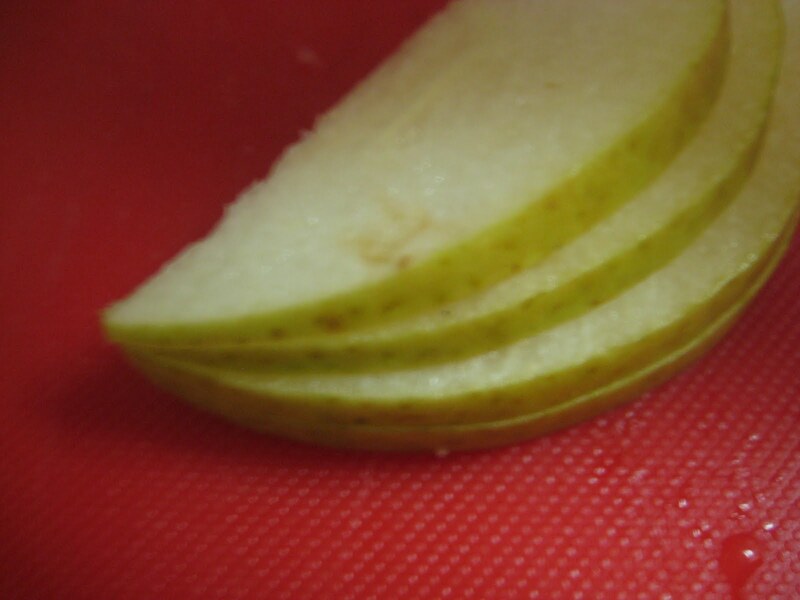 I wanted the pear to be warm, so I sliced the pear thin and sauteed it in the frying pan until it was just starting to carmelize. 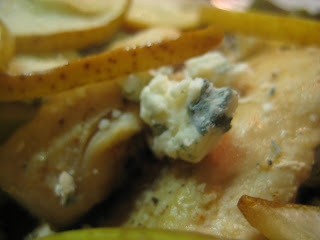 While the pear was cooking, I cut the leftover chicken into bite-sized pieces. I washed my lettuce and arranged it on the plate with the chicken. I sprinkled the salad with a bit of crumbled blue cheese. As the pears began to brown at the edges, I grabbed my handy kitchen tongs and flipped each slice over so it would cook on the other side. Then I started to work on my dressing. I used 1 tablespoon of dijon mustard, a tablespoon of honey and whisked them together. 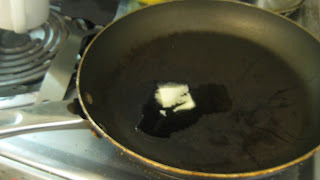 I added a tablespoon of olive oil and continued whisking. A dash of salt, pepper, and garlic powder, and some vegetable stock thinned the mixture and created a delicious dressing. 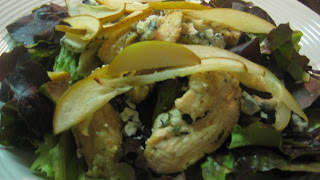 I topped the salad with the pears, drizzled the dressing over the plate, and enjoyed my fast and healthy dinner. wow, what a creative and delicious dinner! impressive! Great salad! I like the idea of warming the pear. Hope you had a great holiday! Let's make plans after New Year's!